This 1965 Shelby Cobra replica was professionally built from a Classic Roadster kit with a 302 c.i. fuel injected V8 and a T5 5-speed transmission. The Ford 8.8” rear end with a 3.73:1 ratio rockets her off the line and the Metallic Jade Green exterior keeps her looking good standing still. The Cobra was built in Tennessee and has been to Louisiana (where it survived hurricane Katrina!) and Arizona, and recently made its way to Fast Lane Classic Cars from California. Earlier this week, after 18 years, she went home to Tennessee with the man who built her. Two weeks ago, John was cleaning out his shop and came across paperwork for a 1965 Shelby Cobra he built for a customer back in 1999. He became curious about where the car ended up, and after a quick Google investigation he found the car for sale at Fast Lane Classic Cars! 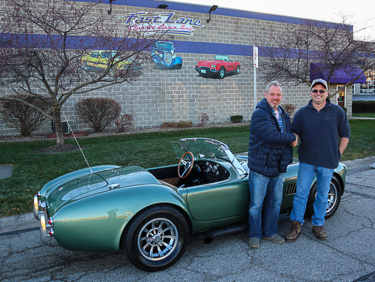 After speaking with Lawrence in our sales department he made the trip to St. Louis from his home in Tennessee and was positively giddy to load the Cobra onto his trailer for the trip home. We have taken so much pleasure in working with John and hearing his stories about building the car and are so happy we could reunite John with the car he built almost 20 years ago! See photos and info of the Cobra here.